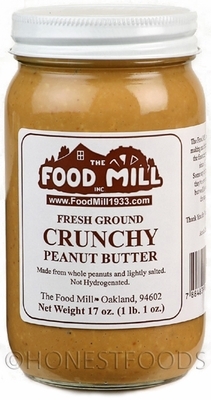 The Food Mill in Oakland has been making Peanut Butter since the 1930's. This peanut butter is still made on the original equipment. The peanuts are ground slowly, so they don't heat up and destroy the flavor. Food Mill Peanut Butter has only been available in the San Francisco Bay Area, but as fans of gourmet peanut butter know, when you find one you really like, you have to have it. If you know Food Mill Peanut Butter, you're happy to find it available here. But if you don't know Food Mill Peanut Butter be warned that once you try it you'll be stuck only wanting to use Food Mill Peanut Butter for the rest of time. Yes, it's that good. Ingredients: Peanuts and salt. That's it. Nothing hydrogenated here!